Our businesses and as us as individuals have expectations, beliefs, and assumptions that if we don’t innovate (or as individuals, have new achievements and personal bests) we will lose business, lose ground against the competition, lose our position, and just plain lose in life. Farnam Street (newsletter@farnamstreetblog.com) has many resources on this topic and how these beliefs and assumptions affect performance. This week it highlighted an article by Andrew Russell & Lee Vinsel called Hail the Maintainers. This article is a wonderful resource and stimulated my thinking for this blog post. The assumption is that if business does not innovate, disruptive events can occur that will reduce performance, up to and including, the end of the business. Russell and Vinsel noted that innovation has become what psychologists would call an embedded, unchallenged assumption. They go on to state that innovation is a small percentage of the time and activity of most businesses. What is actually the case is that many aspects of performance are focused on maintenance. Those who do the maintenance, the day-to-day tasks, recalibration, and incremental improvements deliver consistent results for their customers and clients. They are able to continue and perform day after day. A key element is improvement versus innovation. What does improvement mean for your business performance? On an individual performance level, it is important that we do our own personal maintenance. This involves getting adequate sleep, nutrition, exercise, stress management, and connecting moments. This also implies avoiding behavior patterns that detract from maintaining ourselves optimally such as smoking, over eating, working too much, and others. On an individual performance level, we are faced everyday with maintenance and recalibration choices. Our self-talk related to these choices — our beliefs and judgments about these choices — influence our ability to stay within an optimal maintenance range. This is a complex range of behaviors and attitudes, not very amenable to all-or-none thinking. “Good enough,” “just show up,” “do your best, forget the rest,” and “soft face, calm interior” are a few handrails that can be used to override thoughts and judgments that may interfere with individual performance. My dear friend, colleague, and business partner, Dr. Richard T. Lindsey, used phone cords as his metaphor for the importance of maintenance. His mission was to straighten all the phone cords that were tangled as a picture of maintaining our tools and gifts for optimal performance. He has been so successful that most of our phones no longer even bother having cords! ! There are events such as new laws, new technology, and new delivery models that are innovative and affect performance of business and individuals in dramatic ways. These are game changers, however, they are often not category killers. On the other hand, the majority of businesses and individuals that deliver consistently good service and products continue to perform in their sectorsWhat are the high performance markers for your organization? These indicators would include: profit margin, cash reserves (how long is your runway if a disruptive event occurred? ), debt, cash flow, positive culture, organizational life span challenges and resolutions, clear organizational structure with bench strength and lines of authority, leadership that has clear vision and ability to execute, along with long range cognitive complexity, and finally the organizational ability to identify and make incremental changes as well as remove constraints in work processes and flow. Individually, we also have high performance markers. What is your overall health level? Have you been healthier this year than last year? How is your daily energy? Is it improving or declining? What are your markers on endurance, strength, flexibility, and your immune system? Are your finances better or worse this year? How are your interpersonal relationships? Whether organizationally or individually, noting the tension between innovation and maintenance can be an important awareness that allows for mindful and intentional management. Now remember, Bridging the Gap aims to take all the stuff we’ve been talking about this last quarter and bring it full circle and connect it back to your own personal wellbeing, as we continue to paint a broader picture of health. So without further ado, lets to do a recap of what we saw in Quarter 3 of 2014 which included both our next round of wellbeing topics, as well as a slew of ideas coming from our experts here at MINES. As always let’s talk about those wellbeing topics first. Quarter 3 introduced environmental wellbeing as our new topic and then explored some new connections between some wellbeing topics we have seen in the past. July looked at the connection between physical wellbeing and the newly introduced environmental wellbeing dimensions. It was the middle of summer and we wanted to shed light on how the environmental conditions in both our natural and urban areas impact our physical health and are related in more ways that you may have thought. Next, August is the time of year that most kids start returning to school and will continue to grow both in body and mind, so what better time to explore a new connection between the familiar topics of physical and intellectual wellbeing. We looked at mindfulness techniques and ways the mind can bring balance to the body and how the body can bring peace to the mind through exercise and stress management techniques in order to support this connection. And finally, September focused on environmental and intellectual wellbeing as we brought the quarter to a close. This connection focused on the concept that although we as humans have the ability to shape our environment to an extent, we cannot escape the fact that the environment we live in will inevitably shape at least some features about who we are and how we behave. Now let’s talk about those blog posts. By now it’s no secret we like to share inspiring and helpful stories as well as helpful resources on our blog, and these last 3 months have been no exception. We saw Dr. Robert Mines talk about “Developmental Stages versus Skills in Leaders by Managerial Hierarchy,” which took a look at a complex issue facing a lot of businesses as newer generations clash with older ones. To follow that up our expert case manager Whitney Stone gave us plenty to think about in her examination of “The Second Question” which put how we align our identities with our profession under the microscope. Next Ryan Lucas, manager of engagement and development, looked at an important healthcare issue in his post “Healthcare is not just about the people who work in Health IT it’s about everyone”. And then finally BizPsych consultant Marcia Kent gave us our regular dose of inspiration with her latest “reframe” which focused on challenging your perceptions and looking at things from a whole new perspective. To finish off this season of TotalWellbeing we will be looking at the connection between emotional, spiritual, social wellbeing as our final pieces of the wellbeing puzzle for the year. We don’t want to give too much away right now, however, so you’ll just have to stay tuned. For now just remember to take a moment to breathe, relax, and get ready to finish the year strong. And to make sure you do just that, MINES will continue to support you with helpful resources, inspiring stories, and useful tools to make sure you have what you need to get a running start at 2015. You can also email us at: Communications@minesandassociates.com, and let us know what you like, questions you may have, and what you’d like to see us discuss in the future. See you next time! A challenging question for every organization is: how do we develop/train our leaders at every level in the organization? There are assumptions that leadership is composed of a set of skills or processes. 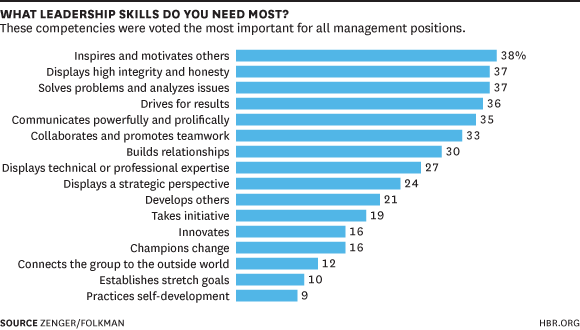 Zenger and Folkman present data in the table below from a wonderful blog regarding C-level officers, managers, supervisors’ perceptions of leadership skills, and qualities necessary to do their job. This blog attempts to sort out the variables into categories that can be used for assessment and intervention. Character qualities such as integrity, honesty, drive, engaging in self-development, or taking initiative are most likely not trainable or teachable. They are qualities that develop over the person’s life time. These are qualities to be assessed when you hire the individual as you are not going to have much of an impact on developing character by the time they enter the work world. Inspiring and motivating others, communicating, building relationships, developing others, and connecting the group to the outside world are all related to a complex set of verbal, written, group facilitation, and teaching skills in addition to the ability to assess team members strengths and weaknesses. Skills are assumed to be teachable and competency can be assessed; therefore, it is important to think through how you would teach these types of skills as part of a professional development plan. Complex problem solving and analysis are a combination of adult cognitive developmental complexity and having the analytic, evaluative, and probabilistic reasoning methodologies. Mines, King, Hood, and Wood (1990) found that there are qualitative differences in complex reasoning as well as critical thinking skill differences. Elliot Jacques’ work also demonstrated that cognitive complexity, which he defined in terms of time span of projects, also increased throughout the managerial hierarchy. The role of strategic thinking also has cognitive complexity elements to the process. These types of processes require a base of methodology knowledge and practice scenarios with feedback from those with more complexity. Finally, the ability to innovate and develop stretch goals may be related not only to the culture of the organization interacting with actual creative skills but also risk aversion and other cognitive bias elements. All of these factors interact in a given individual and present a complex assessment and development challenge for management who have an eye on succession planning and staff development. Have a day filled with kindness! Mines, R.A., Hood, A., King, P., & Wood, P., (1990). Journal of College Student Development, 31 538-547. I want to add a few dimensions to Dani’s blog about our “onslaught” of training requests regarding generational issues in the workplace. The first is an observation about the process of facilitating these events; I am a semi-typical baby boomer. Dani is a pretty typical Gen Y. As we have prepared, discussed and engaged multiple clients in this topic, we have explored our own tendencies, biases and patterns. We have been able to present much of this openly in sessions with clients. It has not only been fun, but also increased our own empathy as well as clients. As we have fun teasing one another about the generational stereotypes it seems to open up insight and discussion in the sessions. There is a sense of denial and/or political correctness that takes some pushing through to help people acknowledge some of the true obstacles they carry around this issue. This is a primary first step for us to engage in this topic in a meaningful way, both for ourselves and clients. The second dimension for us to consider is: “why does this topic seem to have renewed fervor at this time”. I’m not sure we have gotten a good answer to this question yet; only that it does seem to be so. I recently attended the ASTD (now ATD –Association for Talent Development) conference in Washington DC. This is THE international conference in training and development. There were multiple sessions devoted to this topic, including some forefront writers. Possibly the current movement of generations is a factor; Baby Boomers starting to move out & retire- Gen X and Y much more prevalent in the workforce and in leadership positions. I think the best way to address it is to ask you: Do you see this becoming a critical issue in your organization and what are you doing to address it? The final dimension I want to add in line with the theme of BizPsych’s blogs for this year is what have we actually done to promote meaningful change in our training sessions. Truly, process we have initiated in these trainings was borrowed from a training on this topic I attended a number of years ago. This presention was at our local EAP Association meeting. I have been extremely interested in this topic for a long time and attended many trainings on the topic. Always interesting but they left me a little flat i.e. so, we talked about the stereotype differences between generations & why they are there, but what now? In the training at our EAPA chapter they put together a panel representing each generation. Now that was inspiring! I walked away with some truly changed beliefs and experiences. At MINES, we have recently received an influx of generational trainings from workplaces of all sizes and industries. These trainings range from, “Appreciating Generational Differences in the Workplace”, “Here Come the Millennials”, and “Best Practices in Leading and Managing Multiple Generations”. Interestingly though, even though we have had a number of requests, we have a number of participants in our trainings which are rather skeptical about the need for these trainings. No, no, it’s not just Generation X, the skepticism is articulated by individuals in many organizations. Are you skeptical? If you are, you are not alone. Some embrace this topic and find it absolutely essential in the workplace, this is demonstrated by comments such as “I can’t believe how entitled my millennial employees are, they expect to be able to work from home and move up immediately.” “I don’t understand why my Gen X colleague prefers to work alone rather than with me.” “Why do those baby boomers get along so well with the Gen Y’s?” These questions are just a taste of the questions that we hear while delving into this topic. Typically, the initial intent behind offering these trainings is to ease the tensions between the different generations. These trainings offer the premise that although there are theoretically generational differences, there are just as many differences between generations as there are within each generation. This is important to note! Why is that? So that we don’t put others into a box! The guidelines of what incentivizes a Gen Y vs. a Gen X are very helpful! Additionally, what the core values are of each generation are is also important to note! Millennials have, as a generation, had supportive parents who have pushed them to succeed and put a lot on their plate in the process. That is, as teens, many Gen Ys were involved in college prep courses, soccer, dance lessons, and community service efforts, the more the better! Guess what? It served them well! They were able to accomplish so much in so little time and had great support behind them. Now, just what about that working remotely? Can you imagine Gen Ys being confined to a library or desk to study for their exams? That’s highly unlikely; they were more likely studying on the bus to their dance meet or in-between their many after school activities. Did “where” they were studying hinder them? Not from what we can tell! Gen X has historically been known to be the “latch-key kid” generation. Many X’s had both parents working and therefore they had to learn to be self-sufficient early on. One rub that is clearly in play in this statement is the Generation Y’s desire to work with others in a team environment and Gen X’s independence. Many Gen X’s are only interested in what the end game for the initiative is; they would like to paint their own journey. Baby Boomers and Gen Y’s tend to be a natural fit for each other. The Gen Y’s are looking for teamwork, mentorship, and to make sure that everyone is included. The Baby Boomers want to mentor; they are hopeful and want to be part of a team that values their skills and all that they bring to the table. While the Gen X’s tend to be more independent, the Ys and Boomers enjoy the collaboration. Exposure to expertise about generations can increase both understanding and appreciation of what all generations bring to the table! Diversity is often said to be a key ingredient to success. Generational diversity should be embraced!